Everyone will be SITTIN' PRETTY in this spacious and comfortably furnished beach home! Caribbean and beachy decor flows throughout this popular beach retreat. Gather in the living area or kick back and relax on the enclosed porch looking out to the ocean. The open living area includes kitchen with breakfast bar, dining area and multiple seating around a 42" HD LCD TV. Bedrooms on two levels plus an additional den on the first level with LCD TV is also considered the sixth bedroom. The home is located right across from the beach access so getting your feet in the sand will take no time. Private swimming pool offers you the chance to play in your own backyard with plenty of seating and lounging for everyone! Ground-Level: Den with LCD TV, Hall Bathroom, Bedroom with 2 Twins and TV; Bedroom with Twin/Trundle with TV; Outdoor shower. Everyone will be SITTIN' PRETTY in this spacious and comfortably furnished beach home! Caribbean and beachy decor flows throughout this popular beach retreat. Gather in the living area or kick back and relax on the enclosed porch looking out to the ocean. The open living area includes kitchen with breakfast bar, dining area and multiple seating around a 42" HD LCD TV. Bedrooms on two levels plus an additional den on the first level with LCD TV is also considered the sixth bedroom. The home is located right across from the beach access so getting your feet in the sand will take no time. Private swimming pool offers you the chance to play in your own backyard with plenty of seating and lounging for everyone! Top-Level: Living Room with LCD TV, Access to enclosed porch, Kitchen with Breakfast Bar seats 4, Dining Table seats 8, Deck Access, Hall Bathroom, King Master with LCD TV; Queen Bedroom with TV; Queen Bedroom with TV Ground-Level: Den with LCD TV, Hall Bathroom, Bedroom with 2 Twins and TV; Bedroom with Twin/Trundle with TV; Outdoor shower. 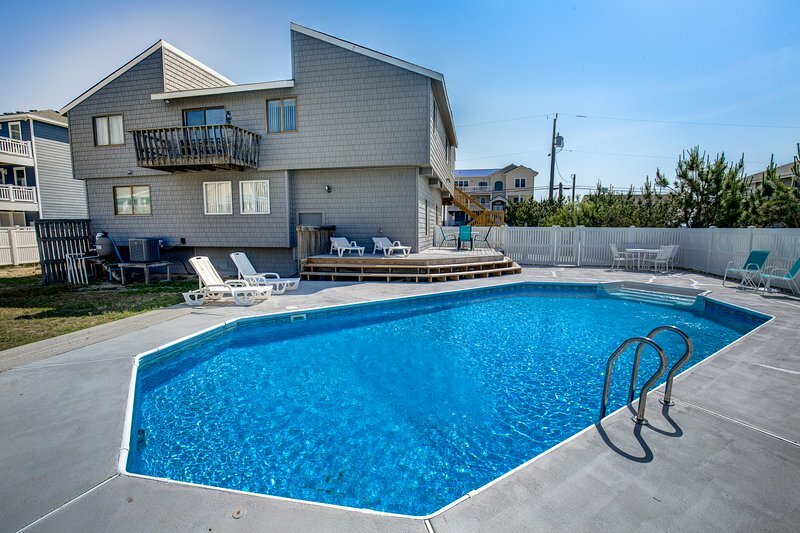 Extras: Private Pool (37x17), Wireless Internet Access, Gas Grill, Horseshoes, No Smoking, PETS NOT ALLOWED, Parking: 5 Cars, Distance to the Beach: 230 ft Additional amenity details: Private pools are open from May 3, 2019 until October 6, 2019. This property is not equipped for pool heat. Pool heat is not an option for this property. Fireplace seen in photos is non-functioning and not available for use. All Sandbridge Blue properties provide bed linens, bath towels, beds made prior to your arrival, and a starter supply of: toilet paper, bathroom soap, paper towels, and dishwater detergent.